treehugger.comHey GRID readers, thinking about trading in your car for an alternative mode of transportation? Halogen TV’s upcoming premiere will certainly give you the motivation to make your travels carless. On Earth Day, April 22, at 8pm (ET/PT) Halogen TV will premiere its latest in activism television, “The Un-Road Trip,” chronicling eco-adventurer Boaz Frankel, as he attempts to travel 12,000 miles across America. The 10-episode series has just one catch—Frankel won’t step foot near a gas-powered car. His cross country trek will surely be interesting to witness, as he hits 10 major cities using every mode of transportation out there, except for the standard automobile. While we sit on our couches, Frankel will explore the nation, using just about anything your imagination can conceive. His whacky list of transportation devices include: whimsical bicycles, a pneumatic pogo stick, a canoe, a hot air balloon, a crop duster, a motorized cooler, a horse, a camel, a dog sled, a Segway, a sailboat, a hang glider, Kangoo jumps—you name it. 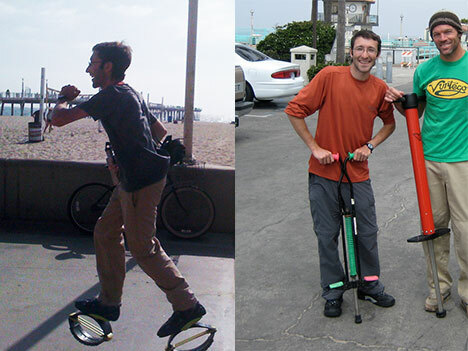 Frankel’s goal however is to not just show us how to travel using Kangoo jumps-a cross between rollerblades and moon shoes, but to meet the inventors, entrepreneurs and government leaders that can help him find alternative, sustainable means of transportation. The show may have us thinking twice before starting up our gas guzzlers--A fact sheet from the U.S. EPA says, "driving a private car is probably a typical citizen's most 'polluting' daily activity"--and opting for a less conventional route. Check out the complete episode guide after the jump! Featured modes of transportation: a motorized cooler, a tandem bike, an agricultural helicopter, a Pi Electric Bike, & a catamaran. Featured modes of transportation: foot, Kangoo jump, rowbiking, pneumatic pogo stick, train, Xtracycle, and yes, a camel. Featured modes of transportation: a Harley, a Segway PT, an electric driving mover, a folding bike, and of course, a unicycle. Featured modes of transportation: an industrial trike, an off-road buggy, a pedal-powered surrey, a PowerWing Scooter, & a barn-stormer biplane. Featured modes of transportation: bike, paraglider, snow bikes, paddle surfs, & bike ferry. Featured modes of transportation: The craziest bikes in the world, no doubt: a couch bike, pick-up truck bike, treadmill bike, & a hula bike, oh and a rollercoaster. Featured modes of transportation: 12-person pedal-powered pub, an aqua-cycle, seaplane, & the good old piggy-back ride. Featured modes of transportation: a puppy-pulled longboard, a 7-person bike, skateboard, & an aerial tram. For more on “The Un-Road Trip,” visit, www.halogentv.com/UnRoadTrip.